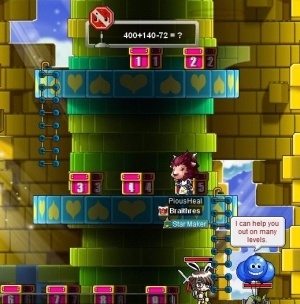 The Ludibrium Party Quest is available to players that are above Level 110. It is a good method of leveling through the 100's and therefore should be done daily for EXP Maximization. It is a challenge which requires a lot of patience and teamwork. It is comprised of 6 stages, some more difficult than others and simpler. This Party Quest can be done with 3 - 6 people. You must have at least 3 party members to begin this quest. These players must all be 30 and above. Also, cure potions such as Eyedrops and Holy Water are recommended while fighting Alishar. All Cure Potions are most convenient because they cure all states. If your party meets all of these requirements, you are ready to begin to PQ! To enter the party quest, you must first head to the 101st floor of the Eos Tower or use the Mirror of Dimension. Then, get the leader to click on the Red Sign to begin the party quest. That is, if no other party is in it. To get into a party, you should ask to join the PQ (Usually by saying J>PQ and your class/level) to grab people's attention in Channel 1 at 101st floor of Eos Tower. There is always the possibility of missing. Missing is when another party clicks faster and gets in before you get a chance to enter PQ. When your party misses, you should automatically try another channel. Leaders usually channel surf and change channels after trying once so it is reccomended to keep up with your leader. Finally! You're in the Ludibrium PQ! Unlike the Kerning City Party Quest, the Ludibrium PQ is a bit more difficult and complex, and will require a lot of precision to complete, even when inside. This is how to complete the Party Quest. You have 20 minutes to complete this quest. There is a box called 'Achievment Ratio' on top which says how far you are in the quest. Move up and down the area, killing the Ratz and Dirty Ratz. Their EXP and Level will depend will be based on the average level of your party. Each kill will net you one coupon however this does not take inventory space. Once all 20 passes are picked up, the stage clears and the portal is opened. Everyone goes automatically into Stage 2 once one member goes through the portal. There will be yellow writing on top saying how many passes have been picked up. 1 Dark Eye left! 'There are no monsters in this room'. This stage has 5 portals. Each portal has two kinds of monsters: Shadow Eye from Another Dimension and Dark Eye from Another Dimension. They portals all arranged vertically with 3 monsters in each portal and the last portal only having 2 monsters. This makes a total of 14 monsters. The monsters level and EXP depend on the average level number of all the party members. All monsters need to be killed to clear the stage. 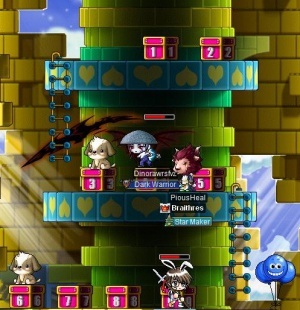 Once the stage is cleared, a portal appears and once one member goes through the portal, all party members gets transported to the next stage. If there are less than 5 people in the quest (assign everyone one room), to find out which rooms have been cleared, there is a message on top saying if the room has monsters or not. Also, when you go back into the main room after going through the portal, a message on top will say how many monsters are left to be cleared. 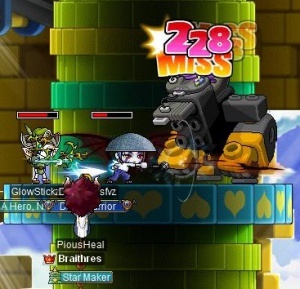 Party Members attacking a Rombot. Stage Four comprises of three main attacking platforms, the bottom, middle and top. Two Rombots from Another Dimension will spawn on the bottom, 1 on the middle platform and 1 on the top platform. To pass this stage, all Rombots need to be killed. The Rombot's levels and EXP will be based on the average levels of all the party members. This time, all players must manually walk to the portal to go in to the next stage. This stage consists of 9 boxes all numbered 1-9. The leader will click on the balloons (all party members must be present in the room) and an equation will pop up on top. The equation needs to be solved and the numbers represent the boxes that need to be stood on. For example, an equation of 20*20+15= 20 multiplied by 20 then add 15, which equals 415. Then the party members just stand on boxes 4, 1 and 5. When the party leader clicks on the Blue Balloon again, the stage is cleared. The portal will open and once one member goes in, all members will be transported to the last stage. If there are only two members left, or a party member is AFK, anyone can simply talk to the Sgt. Anderson and obtain a platform puppet. The platform puppet can take the place of a party member. This is the sixth and final stage. This is the stage where members must face Alishar. The HP, EXP, and Level of Alishar will be based on the average level of all the party members. Your Cleric should Heal if members need so, however Alishar has been significantly nerfed in newer updates. It is reccomended that magicians use Magic Guard to reduce damage. Alishar can jump and move to the very edge of both sides of the stage, so unless your party is quick at killing him, you might find your party hemmed in on one edge. Mages can try and teleport to the other side, but everyone else will have to walk past it. Alishar will put status condition on you. The status condition can either lock up all your skills or blind you to drastically lower your accuracy. You should use Holy Water for the lock or Eyedrops for the blindness. Alternatively, you can use All Cure Potions which will cure you of both the Lock and blindness. Waiting for the curse to wear off is not an option, due to the nature of the battle. If you did not bring any cure potions and get cursed, you will just have to stay out of battle. Mages need not use Eyedrops, because they will not be affected by lower accuracy. After losing about 1/3 of his health, he will begin to summon Chronos. After lowering his health further, Alishar will start summoning Platoon Chronos in addition to Chronos. Alishar will begin to summon Master Chronos as well when he has about only 1/3 of his HP left. The Chronoses should be handled by the players who cannot hit Alishar or by a Cleric using heal. Be prepared to use your own HP-restoring items if necessary, as the party can get spread out and/or separated with Alishar in between them. If either of those situations occur, you may be without the help of your Cleric. Once Alishar is defeated, everyone will be given EXP based on how many members there are, the average level of all members and the level of the other party members relative to you (i.e if you join a party with people over level 100 and you are level 30, you will receive less EXP). You will also receive some Willpower and Insight EXP. This is not a stage, however to exit the party quest, you will need to talk to Artuto. He will let you leave the map. AFK-ing. This causes trouble, whether you are in the PQ or trying to get in. You will hold up your party if in PQ because no one can advance to the next stage without you (Assuming this is stage 5). Flaming. Try not to flame as it could escalate situations beyond what they are. Slacking. It is selfish to sit at the bottom of the map while all your party members kill the monsters, letting you leech from it. A PQ requires all the party members to work together. Disconnecting. Of course if you cannot get a better computer, try switching your graphical mode to the lowest possible. Note that this may cause confusion in Stage 6, when you cannot see the boxes clearly. Stay out of fights (except for the boss fight) as far as possible. Inevitably, during your PQ career, you will come across some nasty people. When that happens, do not panic, and follow the steps below. 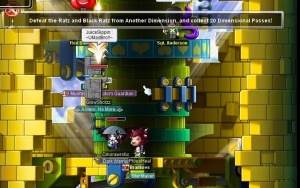 Occasionally, there will be a party member that disconnects or simply left the party for no reason. There is no problem with this. Just simply continue with the Party Quest. When you get to Stage 5, be sure to see the Platform Puppet. Don't kick the person straight away, just in case they log back on. Occasionally, there will be a party member that does not respond, because he is not at the keyboard. Of course you should wait for them, but when it is apparent that they will not be there for a long time (Assuming this is stage 5) then just leave the Party Quest (with the leader) and invite someone new to the party quickly to go back in. Occasionally, there will be a party member that is rude toward you. Please know that this is like the real world where you might hate your peers but you must ignore them. Simply remember the rule of "don't feed the troll," which simply means don't talk to him or her. If you do not desire that person in the party, ask the leader to expel the person once outside (Party leaders can not expel while in the PQ). Party quests has terminology which many be confusing to first time party questers. The following are used commonly in the Ludibrium Party quest. 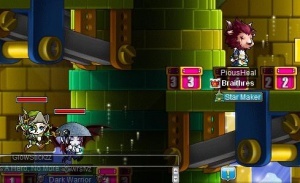 Pass - The ETC item that allows the leader to clear the stage, which opens the portal to the next one. The first stage only has this. Miss - The leader fails to get the party into the party quest and another party enters the party quest. Out - The current party inside the party quest is now out of the Party Quest, enabling another party to get in. All monsters will have the same level as the average level of all the party members. Their EXP and HP is adjusted accordingly. The total EXP for finishing this Party Quest is also based on your level, the levels of other party members and how many party members there are. Once you complete this 35 times you get an item called Broken Glasses which has a high market value after using Scissors of Karma. This page was last edited on 14 June 2016, at 07:11.